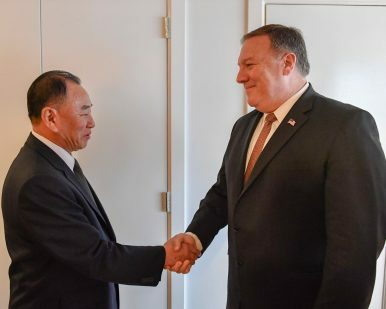 As I arrived in South Korea for a short visit this week, I learned that North Korean leader Kim Jong Un’s point-man on negotiations with the United States, Kim Yong Chol, had decided not to go to New York, where he would have met U.S. Secretary of State Mike Pompeo. That wasn’t entirely surprising given the trajectory of the U.S.-North Korea diplomatic process in recent weeks—since Pompeo’s early October trip to Pyongyang. The State Department, in a bid to avoid embarrassment, attributed the cancellation of the Thursday encounter to scheduling issues. Days earlier, Pompeo had beamed on U.S. cable news shows about the supposed New York meeting, which would mostly have consisted of planning for the next summit between Kim Jong Un and U.S. President Donald J. Trump. What does the ghosting tell us? Well, firstly, this is not a new tactic for North Korea in diplomatic negotiations with the United States. In fact, we saw this tactic used earlier, when North Korea’s logistics and planning delegation for the June 12 Singapore summit failed to show up for scheduled talks with their U.S. counterparts in Singapore in May, raising concerns that the summit wouldn’t be able to come together in time. The ghosting also comes as North Korea is mincing no words about the core concession its seeking right now: sanctions relief. North Korean state media has featured several important commentaries and paraphrased Kim Jong Un’s complaints about the international sanctions regime. This past week, Uriminzokkiri, a state-controlled North Korean website with links to the United Front Department, which Kim Yong Chol controls, published a commentary attributed to Kwon Jong Gun alluding to the possibility that Kim could resume the build-up of nuclear forces overtly if the United States wouldn’t budge on sanctions. Kim‘s ghosting also raises the likelihood that the United States and South Korea will come to a decision sooner rather than later to postpone next year’s scheduled Key Resolve/Foal Eagle springtime military exercises. This would have likely happened anyway to sustain the diplomatic process with North Korea; Pyongyang has long pointed to these springtime exercises as the most provocative of all peacetime defensive exercises by the United States and South Korea. Even with the latest road bump, we’re likely still on track for that second Trump-Kim summit. On Wednesday, the day after the U.S. mid-term elections, Trump said that he expects he’ll meet Kim early next year. For North Korea, that meeting will be the only way—if one exists at all—to get to some kind of sanctions relief. Pyongyang has realized that Trump’s deputies bring a conventional U.S. approach to talks. As recently as Sunday, Pompeo insisted, for instance, that no sanctions relief would come before North Korea had completely denuclearized. Trump, by contrast, showed himself to be less reliant on the old shibboleths of U.S. North Korea policy at the Singapore summit. North Korea has calculated—correctly, by all accounts—that another meeting with Trump will be the best way to increase its odds of getting what it wants.